Why Homestead? Well, I am going to start by telling you the reason why we want to homestead. You see I am a pioneer girl at heart and grew up longing to be Laura Ingalls Wilder, I mean my name is even Laura. Once I got married and became a mom that longing became very real. You see the times we are living in are not like it was back in the 1800's, where simplicity and homesteading was just a way of life. Back then it was a necessity in order to survive. You had to prepare for winter in order to not starve or freeze. Now fast forward to todays living, where we have everything done for us , a washing machine washes our clothes, a microwave cooks our food, electricity powers our furnace, a grocery store has our food and anything else we may need. Our society is more concerned with whats going on, on facebook ,twitter, television shows and anything else. I'm not saying all these things are bad I'm just saying we have lost our way, we no longer think and do for ourselves. So, this brings me to why I want to homestead. With the world and economy looking the way it does I believe that things are going to get very bad before it gets better. Now, I am a christian woman and fully trust the Lord but the good Lord also gave me a brain. Just as Joseph helped the Egyptians store up for the seven years of famine, so shall I. My family and I have moved from a house in a suburban subdivision to a little house in the country to learn how to get back to the basics of life. I will be starting a garden next spring and canning and preserving all the produce. In the mean time I am learning how to can this winter so I will be prepared for the next harvest. We also are getting our house in order , meaning having no debt! I will be exploring off grid washing too ! We are already reaping the benefits of having chickens and now have fresh eggs daily. Hopefully once our property is fenced we will be getting some meat birds, a pig and maybe even a cow. It is also a goal of ours to prepare by having basic ingredients like flour, beans, rice ect. We are also looking into solar and alternative lighting. All of these things anyone can do , and so along with my husband and our three children we will be learning new skills to carry us through anything. We believe it is our duty as christians and parents to live as sustainably as we can in a world that is falling apart, and to be prepared for anything. Now this is a journey and a long one, all of this stuff will not be learned in a day but over time. As long as we keep moving forward and keep trying and trusting God we will not fail. 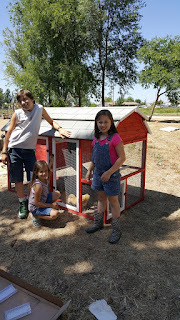 Our Three children with there chickens ! !